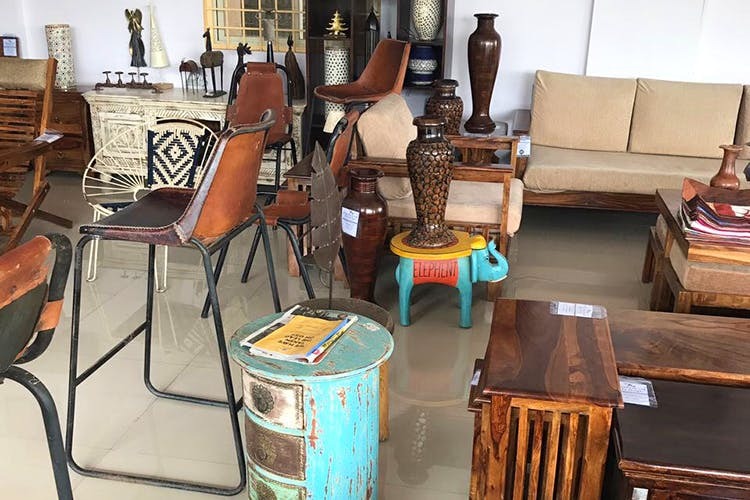 Give your space a new life with the chic and functional hardwood furniture available at Natural Living in Kalyan Nagar. From classic pieces to quirky and hipster designs, you’re sure to find something here that’ll tickle your fancy. From a classic rosewood sofa set to a pale green chest of drawers, Natural Living is a furniture and decor store that has something for everyone. Working primarily with rosewood, all their furniture is built to last. When we think of sheesham and hardwood furniture, we automatically think of the traditional and old worldly furniture at our grandparent’s houses. But Natural Living is not afraid to play around with design and feature some quirky stuff, especially when it comes to their smaller pieces like coffee tables and chairs. We spotted a light blue wooden elephant that also doubles up as a coffee table. They also have a cycle lamp - a vintage lamp with an old-school cycle pedal incorporated into its stand. Like things simple and classy? There are plenty of elegant and understated pieces like sturdy beds, sofas, chairs and tables. Exporting lifestyle furniture from places like Australia, New Zealand, America and Europe, Natural Living also manufactures its own designs and pieces. All the hardwood furniture comes with a lifetime warranty, which means their beds, sofas, tables and chairs are in it for the long run. Prices for the beds start at INR 35,000, and a sofa will set you back by about INR 46,000 or more. Lamps, statuettes, book shelves, nesting stools and even shoe racks, Natural Living also does home accessories and decor. Just as quirky as some of their furniture, the decor here is also worth checking out. They have cubicle and zig-zag book shelves that are sure to start some conversations and we’re also fans of their nesting stool range, which comes in sets of twos and threes. Prices for their decor starts at prices as low as INR 1,000. If you ever get bored of the piece you’ve bought, these guys guarantee that they’ll buy it back from you ten years after you purchased it at 60 per cent of its original cost. So anything you get here seems like a safe bet.